I'm sure I'm not the only person hoping that the recent record-breaking mini-heatwave in New York is not an indication that we'll be making a direct transition from winter to summer without the intermediary of spring. I need the spring -- it's when I do my best daydreaming. Daydreaming of the cute little sundresses I can't afford or the vacations I don't have the time to take. Like to Tuscany. Or to Barcelona. Or to Paris. Thankfully, I no longer have to mourn all of those missed Parisian holidays since I am a mere train-ride away from Le Paris Bistrot (formerly Le Bistro Du Nord) on the Upper East Side, where Stephen and I were invited to dinner by owner Patrick Laurent. Not even five minutes after we were seated did we make the same observations -- we felt right at home and we didn't feel like we were in New York anymore. After a brief look at the menu, we immediately deferred to the recommendations of Chef Yllan Laloum. We shared everything. To start, we had tastings of salad: La Salade De Carottes Et Céleri Remoulade ($10) and La Salade Verte Organique Aux Fines Herbes ($9). The carrot salad was light, crisp, fresh, and dressed with an amazing citrus vinaigrette that really brought out the natural sweetness of the carrots. In comparison, the celery remoulade, made with the white celery root rather than the green celery stalk, tasted bland and flat and slightly overpowered by its mayonnaise-based dressing. Of those two salads, we definitely preferred the former. Now, the salad with organic mixed greens and herbs was outstanding - minimal ingredients, but prepared in a way that made me completely reconsider the definition of salad. As is, it was delicious, but the flavor was almost magically transformed after we dragged the greens through the balsamic reduction at the edge of the plate. While I was spending quality time with the salads, Stephen dug into La Terrine De Canard Et Sa Garniture ($9). Presented on a rustic wooden board, the homemade duck pate came with crusty pieces of bread, a spicy mustard, caramelized onions, and a jar of pickles. Here, again, Chef Laloum played successfully with layers of flavors. Alone, the pate was rich and decadent and something I wanted to put into my purse to save for later. But when we combined it with the caramelized onions, the smell and taste of the rosemary just popped. To be fair, I smeared a little bit of the mustard on the bread before having one more bite but found that its spiciness just overwhelmed everything else. Though, perhaps my palate just can't handle mustard since I don't eat it very often. By special request, I had Chef Laloum prepare us a plate of Les Escargots De Bourgogne Au Beurre D' Ail Persillé ($9). In other words... Burgundy Snails with Garlic and Parsley Butter. I know I'm going to get ahead of myself when I say this, but this was by far our favorite dish of the night. Seriously, it defied all rules of logic. The dish was highly aromatic and the pungent smell of the garlic lingered in the air after the plate was placed in front of us, but after eating the snails, which were presented swimming in the parsley butter sauce outside of their shells, we were left wondering where the garlic was. We could smell it but barely taste it. Truly a marvel. 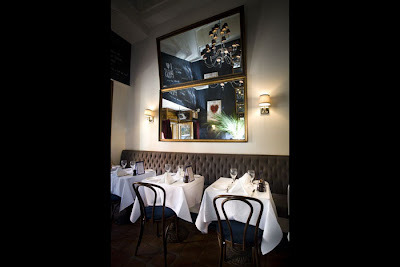 If you have a chance to dine at Le Paris Bistrot, do not skip Les Escargots De Bourgogne Au Beurre D' Ail Persillé. You can thank me later. While I devoured (most of) the escargot, Stephen occupied himself with the generous bowl of Lobster Bisque placed in front of him. I tore myself away from the escargots long enough to try it, and we determined that Stephen enjoyed the soup more than I did. For one thing, he got to it first, so the soup was still hot when he tasted it. Stephen said the flavor was rich, with the lobster enhanced by the drizzling of creme fraiche and clarified butter on the top, but I didn't experience the same thing. As much as we wanted to slowly savor every last drop of that parsley butter, we moved on to the richer main courses. The idea of a French version of macaroni and cheese intrigued me, so Chef Laloum brought out a small bowl of Le "Mac & Cheese" Parisien Et Son Mesclun ($18) for Stephen and me to share, minus the mesclun salad. Made with French Gruyere, it wasn't too salty or heavy and the sauce remained creamy even after sitting out at room temperature for a bit. After a while, though, the flavor was a little overwhelming and I was relieved we didn't have a full plate to get through. On the other end of the spectrum was the rich and savory Plats De Côtes De Boeuf, Braiseés Au Jus Et "Yucon" Purée ($24). The braised short rib was tender and the meat pulled away from itself with only the slightest assistance of our forks. We could taste a hint of cinnamon in the sauce, and I secretly wished I could have licked the plate clean. At this point during the meal, Stephen reached over, squeezed my hand, and said "I'm really happy I'm dating a food blogger." I think it's safe to say he enjoyed the dish, too! As a special treat, Chef Laloum brought out a plate of Le Noix De St Jacque Poéleés ($24). The scallops were grilled and served with a red pepper and leek sauce that tasted just like my Portuguese grandmother's linguica and peppers. I don't know how the chef managed to make that happen, but I'm glad he did. For their size, the scallops were cooked perfectly with a wonderfully caramelized color on the outside and a beautifully opaque color on the inside. Not chewy or tough, the scallops just melted in our mouths. Another exclamation by Stephen summed up the meal so far: "Le Paris, you got me!" And he said that before we had dessert! I wasn't sure I had room enough for two more dishes but when I saw the Crème Caramel Du Bistrot ($7) and Les Crêpes Suzette Flambées ($9) come out, I made room. The Crème Caramel was smooth and delicate and not overly sweet or heavy. Just what I needed after such a filling meal! And the Crêpes Suzette was the epitome of French desserts and was served with a scoop of fresh vanilla ice cream to complement the orange zest and the Grand Marnier. There is no denying it. Stephen and I were spoiled, and our night at Le Paris Bistrot was unforgettable. From the decor to the attentive waitstaff to the skillfully prepared food, we felt at ease -- at home -- the minute we walked through the door. Thank you, Patrick, for inviting us to celebrate springtime in Paris with you! Le Paris Bistrot is open for Lunch, Monday - Friday, 11:30am - 4pm; Dinner, Monday - Sunday, 5pm - 11pm; and Brunch, Saturday - Sunday, 11am - 4pm. All major credit cards accepted.